You have been logged out because another user has logged in using your username and password. Only one session can be active at a time. If you did not initiate a separate log in session on another device or in another browser, you can close the browser and try again or change your password here. If you believe you have received this message in error, contact us at webhelp@ascd.org. Subscribe now for less than $3 per month. 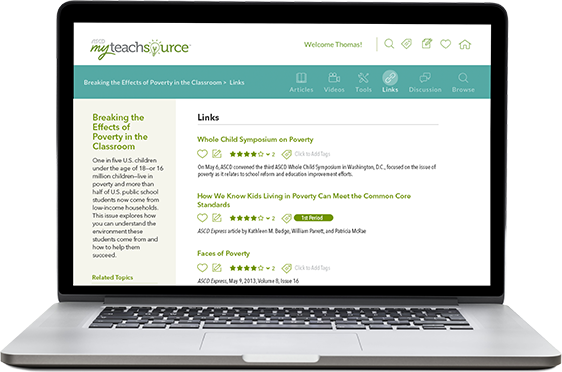 Added and archived monthly, these topic packs feature teacher-driven articles, videos, checklists, rubrics, reproducibles, links, and more that you can easily implement today. Dive into the content immediately with brief, practical articles. Learn from content experts as they focus on techniques and classroom implementation. Download rubrics, assessments, reproducibles, checklists, and more. 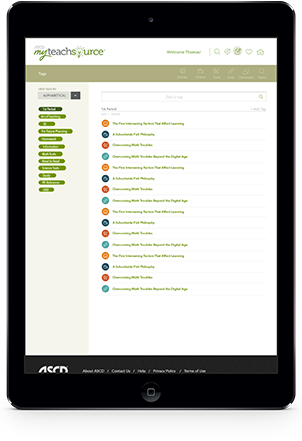 Explore further with links to additional ASCD resources on each topic. Share and learn how other educators are using the content and getting results. "ASCD myTeachSource is a convenient, one-stop resource for individual professional development about topics that matter in today's world. The resources are short enough to respect a teacher's time, yet maintain ASCD's reputation for quality." 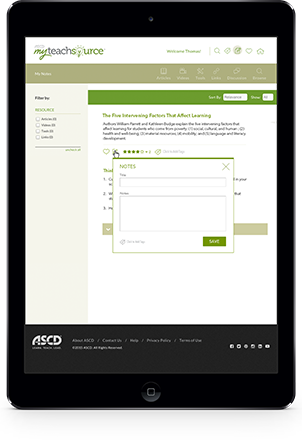 "Whether you learn best through watching videos, reading, or collaborating with colleagues, there is something to help you on your journey toward being a more effective educator"
"Nowhere else can I find teacher content focused on the profession, and it's from ASCD so you know it's quality." 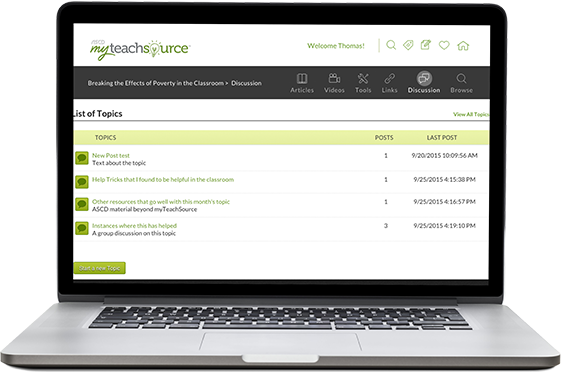 "I like the short content pieces that are easy to digest and use right away and that the topic packs are archived. I can go back and refer to them as often as I want." 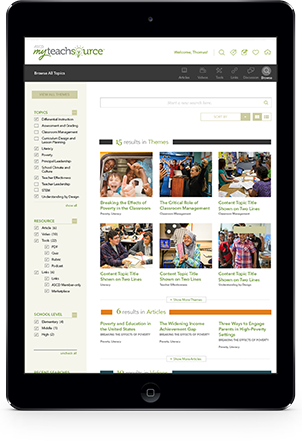 Filter topics to find specific examples of classroom-ready resources in the content library. Add personalized keywords to any article, video, tool, or link to organize the content for your needs. Bookmark your favorite articles, videos, tools, and links for quick access. Add notes to articles, videos, tools, and links to document your action items. 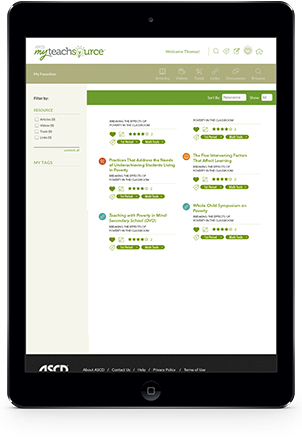 Watch this video for a tour of ASCD myTeachSource. 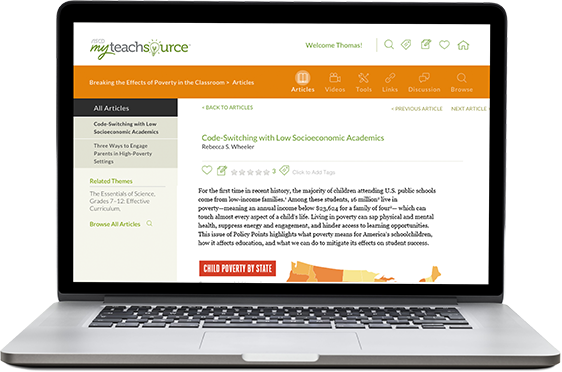 Interested in purchasing subscriptions for your teachers? Group discounts start at 10% when purchasing 10 or more licenses. Call ASCD at 1-800-933-2723, ext. 5773 or e-mail the myTeachsource Team to learn more. © 2019. ASCD. All Rights Reserved.